An environmentalist (The Lorax) tries to save the forest from a greedy clothing manufacturer. 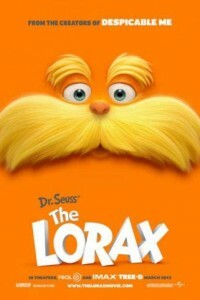 The movie The Lorax is an adaptation of Dr. Seuss’ classic tale of the same name, about a forest creature who shares the enduring power of hope. The animated 3D-CGI adventure follows the tale of a boy, Teddy, (voiced by Zac Efron), as he searches for the one thing that will enable him to win the affection of the girl of his dreams. To find it he must discover the story of the Lorax (voiced by Danny DeVito), the grumpy yet charming creature who fights to protect his world. Teddy’s grandma also features prominently into the mix and is voiced by Betty White.